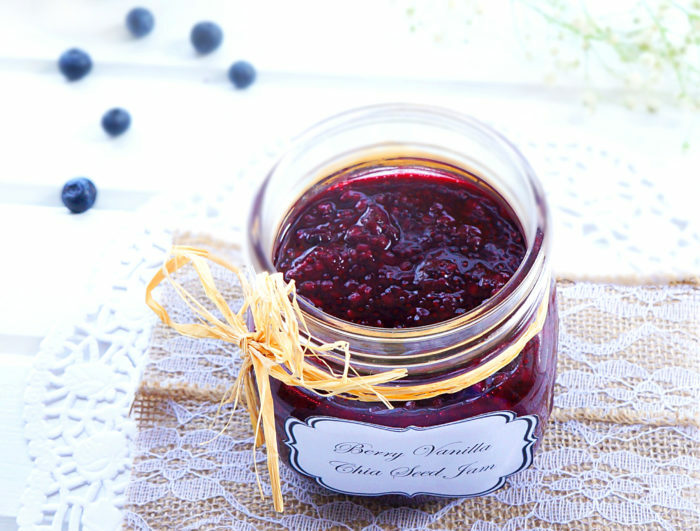 This Berry Vanilla Chia Seed Jam only contains four ingredients and is really easy to prepare. It’s also really flavourful and packed full of fibre and vitamin C. Makes the perfect healthy edible gift! Let me just say…I am super excited about this jam! 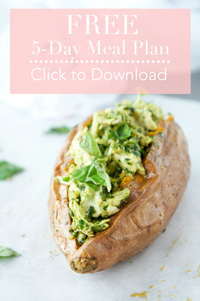 This concoction all came about when I was trying to think of a Christmas gift idea for my dad last year. He’s not materialistic at all and probably owns all the tools, ties, socks, sweaters, checkered shirts and underwear that he’ll ever need. I needed to get creative. One thing I do know about my dad is that he loves to nibble. Nibbles on nuts..nibbles on crackers and cheese…nibbles on all of the weird failed recipe experiments that I make that no one else will eat. He’s definitely my number one recipe tester. I still remember when we went out for dinner as a family for my mom’s birthday last year and he ate the entire loaf of bread on the table with the olive tapenade before dinner. Now don’t get me wrong, he’s no pig or anything, but he does like to nibble on his carbs, dips and spreads. So while I was thinking about all of the things my dad likes to nibble on, this jam came to mind. 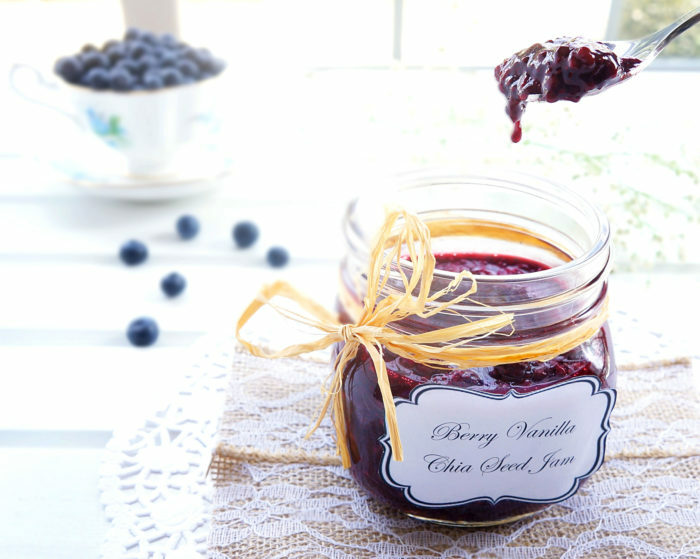 Make the jam, package it in a nice jar. He can have it on some toast or crackers. Boom. Christmas gift done. Since making it for Christmas, I’ve also made it several other times at work and it’s always received rave reviews. Mostly people are fascinated by the fact that it’s only made with four simple ingredients and it only takes 15 minutes to make. What I love the most is that it uses chia seeds without adding any artificial gunk. Oooh don’t even get me started on chia seeds. I’m probably the only person alive who would get this excited about little seeds, but they are that amazing. Full of fibre, omega 3’s and minerals. Plus, they act as the natural thickener for this jam! The only other components necessary are some nice juicy berries, a tad of maple syrup and vanilla extract. So if you have any nibblers in your life, this jam is for you! In a medium-sized pot, bring the berries and maple syrup to a light simmer. Reduce heat to medium low, stirring frequently, and continue to simmer for about 5 minutes. Mash the berries with a potato masher or fork. Leave several berries whole for added texture. Stir in the chia seeds until thoroughly combined and cook the mixture for about 15 minutes, or until it thickens to desired consistency. Stir frequently so that the jam doesn’t stick to the pot. Once the jam has thickened up, remove from heat and stir in the vanilla extract. 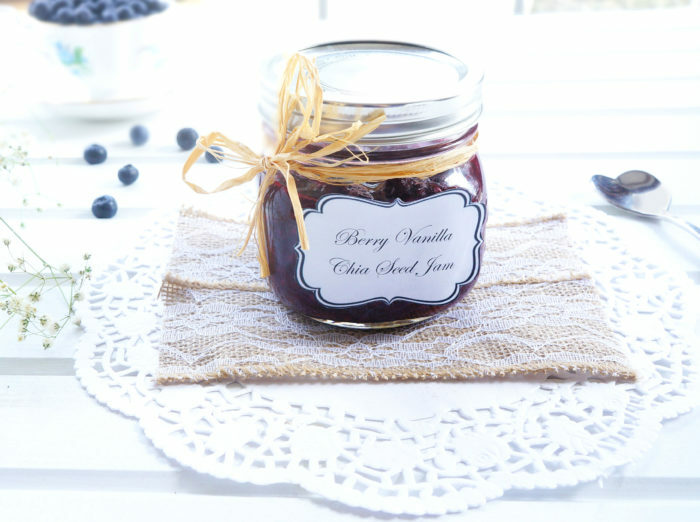 The jam should keep for at least a week in an air-tight container in the fridge or store jam in freezer for later use.